Election ’08: Most Americans revile socialism, yet Barack Obama’s poll numbers remain competitive. One explanation: He’s a longtime disciple of a man whose mission was to teach radicals to disguise their ideology. The presumptive Democratic presidential nominee’s choice of the word “change” as his campaign’s central slogan is not the product of focus-group studies, or the brainstorming sessions of his political consultants. Sen. Obama was trained by Chicago’s Industrial Areas Foundation, founded in 1940 by the radical organizer Saul Alinsky. In the 1980s, Obama spent years as director of the Developing Communities Project, which operated using Alinsky’s strategies, and was involved with two other Alinsky-oriented entities, Acorn and Project Vote. 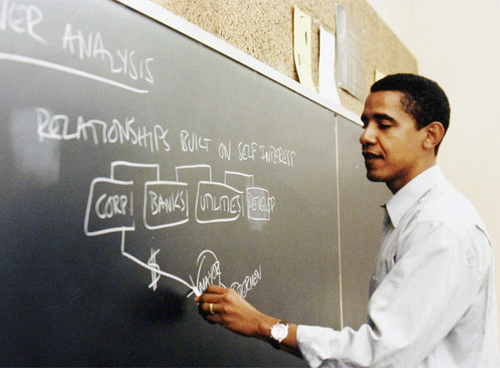 On the Obama campaign Web site can be found a photo of him teaching in a University of Chicago classroom with “Power Analysis” and “Relationships Built on Self Interest” written on the blackboard — key terms utilized in the Alinsky method. Capitalism always was considered the enemy. “America’s corporations are a spiritual slum,” he wrote, “and their arrogance is the major threat to our future as a free society.” Is it surprising that an Alinsky disciple such as Obama can promise so blithely to increase taxes on CEOs? Barack Obama’s “Change We Can Believe In” is simply socialism — imposed by stratagem because Americans have never believed in Marxist economics. Saul Alinsky understood this, and his ghost is alive and well — and threatening to haunt the White House. 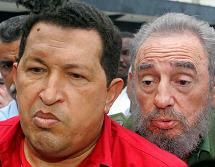 Hugo Chavez. You know who started the War in Georgia ? It was George Bush ! Mérida, August 15, 2008 (venezuelanalysis.com)– On Thursday night, upon his arrival in Paraguay for the inauguration of the recently elected President Fernando Lugo, Hugo Chavez made a declaration in which he accused the United States government of intervening directly with Georgia in the conflict against South Ossetia. South Ossetia is a part of Georgia, which is claiming and fighting for its independence. Georgia has recently been given permission to join the North Atlantic Treaty Organisation (NATO) and has a close relationship with the United States, including sending troops to Iraq. On August 7 Georgia launched aerial bombardment and ground attacks on South Ossetia, to which Russia responded by mobilizing its military into the area. George Bush has demanded that Russia respect Georgia’s territorial integrity and withdraw the troops it sent there a week ago. “I am almost certain that it was the president of the United States, the imperialist George Bush, who ordered the movement of the Georgian troops towards South Ossetia, killing innocent people, and with good reason Russia acted,” Chavez said. The Venezuelan government, in an official statement, celebrated the steps in favor of the reestablishment of peace in South Ossetia. On Jan. 11, 2006, alleged al Qaeda propagandist Ali Hamza al Bahlul waved this sign _ declaring boycott in Arabic _ at the Pentagon’s first effort to stage military trials at Guantánamo. It became part of the official record; since then three more detainees have declared plans to boycott the first U.S. war crimes tribunal since World War II. GUANTANAMO BAY NAVY BASE, Cuba — An alleged al Qaeda filmmaker with a flair for the dramatic set the stage for the first no-contest war crimes trial Friday by declaring a boycott until he is sentenced. ”It is a legal farce,” Ali Hamza al Bahlul, 39, of Yemen, told his military judge, Air Force Col. Ronald Gregory. The slight man with a thick, trimmed black beard came to court in prison issue flip-flops and a tan camp uniform. He is accused of being Osama bin Laden’s media secretary and producing al Qaeda ”propaganda products,” chief among them a recruiting video based on the October 2000 suicide bombing of the USS Cole off Aden, Yemen. Seventeen American sailors died in the blast. Bahlul announced that he already had learned of a verdict in the case of Osama bin Laden’s driver, Salim Hamdan, 40, who was convicted at the first contested war crimes tribunal since World War II. He wanted to go next, he said, but stay in his prison camp cell until sentencing. His Pentagon defense counsel, Air Force Reserves Maj. David Frakt, said he was prepared to fundamentally sit on his hands and not challenge the government’s evidence, because the Yemeni wanted it that way. ”His wish is to boycott. I’m not aware of any obligation . . . to put on a defense,” Frakt said. Even so, he said, it’s the prosecution’s responsibility to prove guilt in a system that presumes innocence. Frakt added that he would consult his New Jersey bar and Pentagon supervisor. In earlier court sessions, Bahlul has admitted to being a member of al Qaeda but denied any role in the Sept. 11, 2001 terror attacks. A succession of defense attorneys assigned to the Bahlul case since 2004 had asserted a series of ethical dilemmas in being ordered to defend an alleged terrorist over his objections. One former lawyer, Army Maj. Tom Fleener, put a previous court on notice that he believed Bahlul had been tortured in U.S. custody. ”He wants a speedy trial,” Frakt, a professor at the Western State University College of Law, announced in court after explaining that Bahlul repeatedly rejected his legal services. In doing so, he appeared to kick-start a congressionally mandated 90-day speedy trial clock, meaning he could be tried by Christmas. Lawyers were to huddle later in the day to draw up a trial schedule. The Pentagon’s chief war crimes prosecutor, Army Col. Lawrence Morris, said that the government would still seek to compel his attendance. Bahlul, who was first charged in 2004 in on-again, off-again proceedings, has long been the most dramatic of the detainees facing war crimes trial. He fashioned a homemade sign declaring ”muqata’a” or ”boycott” in Arabic, and as a byproduct taught a succession of American observers and attorneys the word, muqata’a. He also apparently borrowed on his tradecraft in proposing a state-of-the-art solution to authenticate his daily refusal to attend trial: Send guards with a video camera to his cell each time, he said, and he’ll record it. To force a detainee to court, the military tackles and shackles the man in his maximum-security cell and brings him to the tribunal chamber, a process that can take an hour or more. Bahlul faces three war crimes charges — conspiracy to commit terror as a member of al Qaeda, providing material support for terror and soliciting to murder. Conviction carries a maximum life sentence. Friday’s hearing was the last in a nearly six-week session of military commission cases that saw a jury convict one of the 265 Guantánamo detainees, and pre-trial hearings in the cases of 10 others. The Obama campaign has started contacting people who will receive tickets to see the Democratic candidate give his acceptance speech at the Denver Broncos football stadium.The first Coloradans to be notified were contacted Thursday afternoon. Everyone getting a ticket will be notified by Friday night, the Obama campaign said.More than 80,000 people in Colorado asked for tickets. About half of the 75,000 seats at Invesco Field at Mile High are set aside for Coloradans, Obama officials said. In Montana, the Obama campaign started notifying people Wednesday evening, said spokesman Caleb Weaver. Montana staffers are now vetting people who’ve been notified to make sure they have a place to stay and a way to get to Denver for the Aug. 28 event, he said. He couldn’t say exactly how many people in the state will be granted tickets to the event, only that the requests have exceeded the handful of community credentials set aside for people from the state. Jamie Jackson, a 32-year-old probation officer from Denver who caucused for Obama in February, was among the first in Colorado to learn she will have tickets to get into Invesco Field. She said she plans to go with her mother, Janet Lanier-Jackson, also an Obama supporter. Tickets must be picked up in person on Saturday or Sunday at one of 13 Obama campaign offices across the state. Those picking up a ticket must show a photo ID then activate their ticket online, by phone or in person by Aug. 19. Any tickets not activated by then will be distributed to people on waiting lists. One ticket-seeker whose name is on a waiting list now is Dan Pailas, a Boulder musician. He said he called for tickets Monday, four days after the campaign announced it had started a waiting list. Less than 24 hours after convention officials and Obama campaign began taking requests last Wednesday, more than 60,000 people in the state called or registered online for tickets. Pailas, who has given money to the Obama campaign, said he also posted a notice on Craiglist offering to buy tickets before finding out the Democratic National Convention Committee prohibits tickets from being sold. Convention officials say the barcodes on any tickets listed for sale online will be deactivated. The first three nights of the Democratic National Convention will be held at the Pepsi Center. Obama’s speech, on the final night, was moved to accommodate more people.